JCM MED offers a range of sterile medical devices mainly related to IV therapy. Do not hesitate to ask for our Technical Data Sheets. 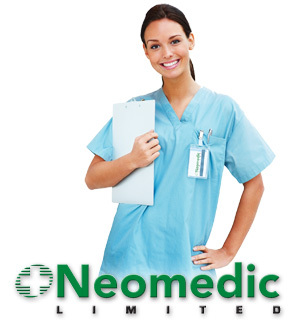 Neomedic Limited was established in 1997 with the explicit aim of being the worldwide leader in the manufacture and supply of integrated medical disposables. 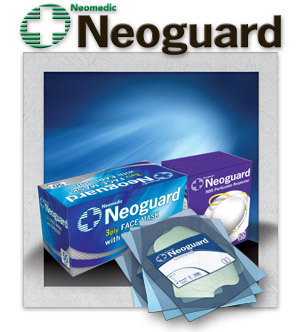 Since that date, Neomedic Limited has become one of the United Kingdom’s largest ISO 9001:2008, ISO 13485:2003, CE, CMDCAS and WHO PQS Certified manufacturers and exporters of medical disposables. This has led to the establishment of a worldwide network of distributors, with the product present in over 60 markets incorporating Europe, the Middle East, Africa, South Asia, North/Central/South America and the Caribbean. 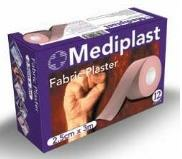 Traditional Flexible fabric plaster with extra-strong adhesive. Quality materials made from premium quality fabric. offering a certain amount of flexibility. Extra-strong adhesive ensures dressing stays in place. 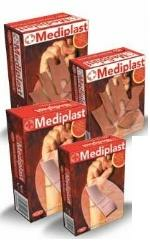 protect the plaster from dirt contamination when not in use. 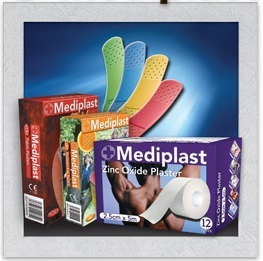 Traditional non-stretch plaster with extra-strong adhesive. Quality materials made from premium cotton. Strong non-stretch materials are ideal for securing larger dressings in place. the plaster from dirt contamination when not in use. High quality silk effect material with hypoallergenic adhesive. while keeping plaster firmly in place. size dressings and for securing IV lines and cannula. High quality clear micro perforated waterproof material with hypoallergenic adhesive. And premium quality porous materials allow wounds to breathe and heal efficiently. to medium size dressings and for securing IV lines and cannula. of wound while keeping plaster firmly in place. r from dirt contamination when not in use. Soft non-woven paper tape. Virtually painless upon removal. 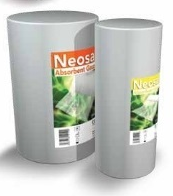 Soft non-Woven paper tape made from hypoallergenic materials. 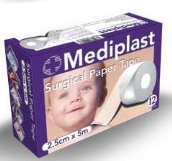 Strong yet tearable material is ideal for securing dressings on delicate and sensitive skin. Mediplast Surgical Paper Tape is supplied in a unique tape dispenser. to promote the efficient healing of small wounds, cuts, scrapes and other minor injuries. comfortable and secure protection of the wound during the healing process. Fabric weave ventilates wound and promotes, quick natural healing. Quality materials stretch and conform to different shapes and forms. Guarantees freedom of movement and activity. 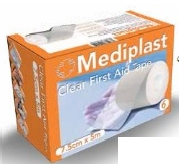 Powerful adhesive seals and prevents contamination of wound whilst keeping plaster firmly in place. Larger, softer pad with antiseptic; cushions, protects and aids in faster healing. without misshaping and keeps the wound sealed at all times. wound is exposed to water, thereby guaranteeing total wound protection at all times. Special adhesive ensures plaster stays on, even when in water. Micro-holes allow air in for natural healing, whilst keeping water and germs out. of small wounds, cuts, scrapes and other minor injuries. Special adhesive ensure plaster stays on even when in water. Clear, discreet material for washproof healing. Micro holes allow air in for natural healing, whilst keeping water and germs out. that is recommended for use on children and sensitive skin areas. 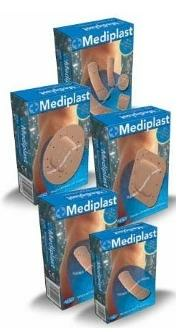 Mediplast Hypoallergenic plasters are the caring choice for wound treatment of delicate skins. Soft and stretchable materials conform to every movement. Low-allergy adhesive ensure that plaster is securely but gently held in place. Multicoloured Waterproof strips for fun based quick, natural healing and protection of wounds, cuts, scrapes and grazes. A special hypoallergenic adhesive ensure that the plaster stays on even when exposed to the rough and tumble of a child's fun packed day. Soft pad, cushions and protects wound. Flexible material stretches with every movement without misshaping. Special adhesive ensure plaster stays on for extended periods. Three part syringe with latex or latex-free gasket to prevent leakage from barrel. Unique mechanism locks plunger into needle hub and draws the needle into the barrel. Plunger arm then snaps off leaving the needle in the barrel and preventing reuse of the syringe. All packaging is colour coded for size as per Neomedic's in house colour scheme. Furthermore all needle hubs are colour coded according to the ISO colour scheme. Certified to ISO 9001:2008, ISO 13485:2003 and CE standard. all needle hubs are colour coded according to the ISO colour scheme. the precise dose is administered without any wasteage. so as to cause minimal pain when used. Available with or without mounted needles. 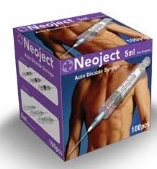 Neoject needle are precision ground, with acute angle tips, free of imperfections so as to cause minimal pain when used. All packaging is colour coded for size as per Neomedic's in house colour scheme. Furthermore all needle hubs are colour coded according to the ISO colour scheme. Precisely ground to an acute angle and extreme sharpness. 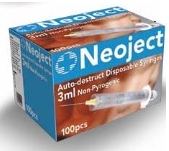 Neoject Hypodermic needle cause minimal pain and are less traumatic when used. Disposable boxes to ensure the safe storage and destruction of sharps after usage. Available in both plastic and card. Neogloves Latex Examination Gloves are made from premium quality latex for extra protection against infections and viruses. Available in powdered and powder-free formats. Powder-Free gloves result in lower protein count and lower risk of skin allergy. Powdered gloves are lightly powdered for ease of donning. Micro textured or smooth surface for increased sensitivity or better grip and control. Beaded cuff and ergonomic design for added strength, comfort and ease of use. 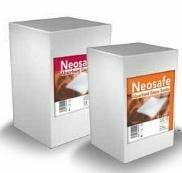 Neogloves Nitrile Examination Gloves are made from premium quality latex for extra protection against infections and viruses. protection against infections and viruses. Smooth surface for increased sensitivity. Available in 40cm and 50cm lengths. 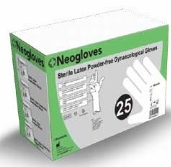 Polyethylene gloves for basic protection and light medical use. Rubber flocklined gloves for use where greater barrier protection is required in non-precision area. Also for use in general hospital cleaning and maintenance . NeoVac Guedel Airways are used to provide an unobstructed oropharyngeal airway during general anaesthesia or where patient is unconscious. 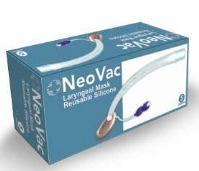 Neo Vac Guedel Airways have smooth rounded atraumtic edges , with similarly smooth airways for easy cleaning and a bite block to prevent closure of the airway. All NeoVac Guedel Airways are colour coded for size in order for ease of use. and can be used for ventilation and administration of medication. Each tube is marked with a radio-opaque line with guides for accurate placement . 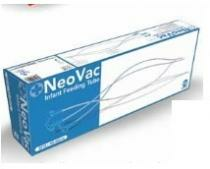 NeoVac Infant feeding Tubes are available with male or female luer lock. Each tube has a closed distal end with two lateral eyes. All NeoVac Infant feeding Tubes are colour coded for size in order for ease of use. Plastic mask that covers the nose and mouth , used in oxygen therapy when tank based oxygen is being administered. Soft plastic tubing wich uses two moulded prongs to provide oxygen via the nostrils. Used in oxygen therapy when tank based oxygen is being administered. Distal end with four lateral eyes. Sof and kink resistant PVC tubing. 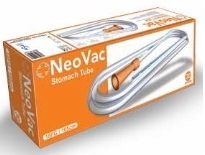 All NeoVac Stomach Tubes are colour coded for size in order for ease of use. the trachea and bronchial tube. Lateral eyes for efficient drainage. Thumb control for easy regulation of suction action. 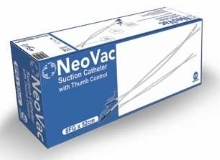 All Neovac Sucation Catheters are colour coded for size in order for ease of use. 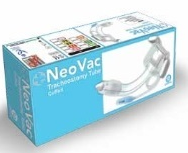 NeoVac Yankaur Suction Sets are to be used in pre-operative removal of body secretions and fluids. Soft and kink resistant PVC tubing. Crown tip for non-abrasive contact with skin and tissue. Easy to use Yankaur handle built to withstand sustained negative pressure. Funnel end connectors at both ends of tubing. 4 – ply absorbent cotton gauze. Manufactured from a fine, strong and highly absorbent cotton yarn. Available with or without X-Ray detectable thread in rolls or as a folded piece. 8, 12 or 16-ply Absorbent Cotton Gauze Swabs. Manufactured from a fine, Strong and highly absorbent cotton material. Available with or without X-Ray detectable thread and in non-sterile packs of 100’s or sterile packs of 2’s, 5’s and 10’s. Support bandage available in a continuous roll that can be cut to suit individual circumstance. 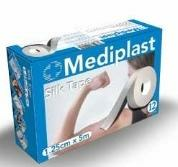 Available in a variety of diameters and used in the treatment of soft tissue and muscle injuries. May also be used to secure dressings. Made from highly absorbent pre-washed cotton, Laparatomy sponges are used in situations where maximum absorbency is required. Available with and without x-ray detectable loop. 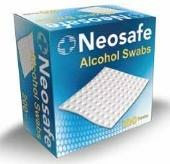 70% isoporopyl alcohol non-woven swab, sealed in individual pouches and used to disinfect local sites prior to the administration of a dressing or medication. Wide Open Weave Cotton Gauze Bandages. Packed in dozen, with an option of a 3, 4 or 5m length. Soft Absorbent Cotton Wool Rolls. 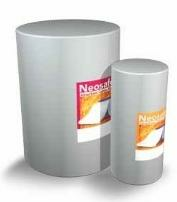 Layered roll of absorbent cotton, interleaved with paper for ease of use. 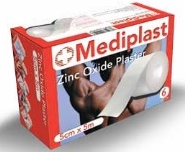 Plaster of Paris is used for the treatment of bone fractures , soft tissue injuries and for general immobilization. Premium quality material ensures high strength , long-lasting casts with fast setting times. High quality weave guarantees even flow of water resulting in a cast of uniform strength and feel. Certified to ISO 9001: 2008 , ISO 13485 : 2003 and CE Standards. 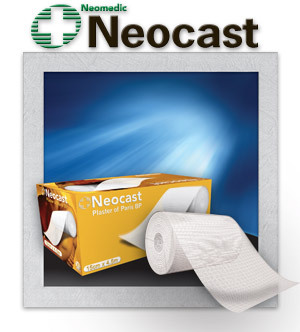 Neocast undercast padding is manufactured from synthetic materials and is used to protect bones and nerves under plaster of paris and synthetic casts. Soft , easy tear material allows the roll to be cut into any size. Self adherent for ease of application onto all body contours. Certified to ISO 9001 : 2008 , 13485 : 2003 and CE standards. Neosport Crepe Bandages are used to provide support for strains , sprains and weak joints. A high level of elasticity coupled with a unique dual weave pattern allows the bandage to shape round the contours of the joint thus offering enhanced support. Stitched edges prevent bandage from fraying , thus increasing life-span of the bandage. 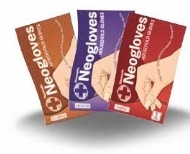 All Neosport Crepe bandages are packaged with secure clips to retain the bandage in place. NeoVac IV Cannulae are used for stable , long term infusion therapy. 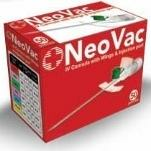 NeoVac IV Cannula are supplied with precision sharpened needles designed to minimise pain upon use. Pyrogen free for as long as the integrity of the inner wrapper is maintained. 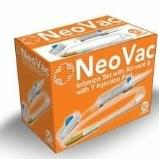 NeoVac Infusion Sets are used for the transfusion of blood or blood components. to minimise pain upon use. as long as the integrity of the inner wrapper is maintained. and kink free PVC tubing. 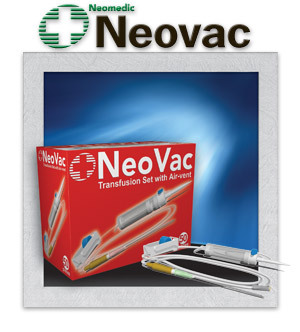 NeoVac Transfusion Sets are used for the transfusion of blood or blood components. to minimize pain upon use. for as long as the integrity of the inner wrapper is maintained. NenVac Scalp Veins combine high-grade materials and modern manufacturing techniques to produce high quality air tight and kink free Scalp Veins with ultra-sharp needles , thus minimising pain when used. NeoVac Foley Catheters offer a sterile and easy to use solution for bladder drainage. The catheter is provided with two/three outlets. The first for balloon inflation and the second/third for bladder drainage. All NeoVac Floey Catheters are colour coded for size in order for ease of use. NeoVac Nelaton catheters are used for short term urine drainage. NeoVac Nelaton Catheters can be applied with an X-ray line for X-ray visualisation. Universal port for connection to Urine Bag. Non toxic and kink free siliconised PVC tube. Soft rounded tip with lateral eyes for efficient drainage. 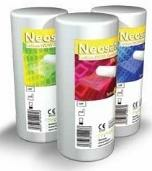 All NeoVac Nelaton Catheters are colour coded for size in order for ease of use. Medical grade PVC bag for the collection and drainage of urine. Plastic clamp that is used to seal the umbilical cord after severance until such time as the umbilical cord has sufficiently dried and sealed. Used to puncture skin in order to obtain blood specimens. Steel lancets are for simple lab use whereas disposable lancets come in a protective plastic housing. Protective mask that is worn to protect against inhalation or dispersal of bacteria by either the healthcare professional or patient. Used to keep the hair neatly in place and to prevent contamination of clean sites by falling hair. Used to protect the wearer from contagious diseases when working in a high risk environment. Contains features to ensure no viral or bacterial penetration. Used to protect both the healthcare professional during surgery from liquid or blood based pathogens. A one piece protective garment used to provide protection from contaminants. Protective sheet worn to prevent splashing and staining of clothing by liquids and blood. Non Woven shoe Cover –Worn to prevent the spread of bacteria , dirt and germs that can be on footwear. Non Skid Shoe Cover – Shoe covers that have an additional anti skid treatment on the sole to prevent slipping. CPE Shoe – Made from chlorinated polyethylene. These shoe covers are lint free and impervious to liquids. N95 masks are particulate filtering masks that offer protection against airborne particles and fluids. Offered in a variety of forms with varying levels of particulate filtering valves. 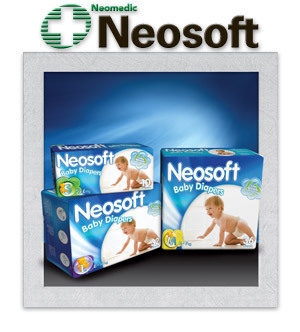 Super absorbent single use diapers for adult incontinence. 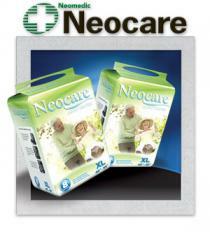 Combining ease of use and discreet design these diapers allow for an adult to carry on their normal lifestyle whilst free from the embarrassment of incontinence. Scented non-woven moist cloths that are soft and can be used for the gentle cleaning of sensitive baby skin. Super absorbent baby diapers keep babies dey for extended periods of time and allow for maximum freedom of movement and activity. Optional Features Blood Sampling Port , Blood Sampling Bag , Needle Protector . Blood Sampling Bag , Needle Protector . 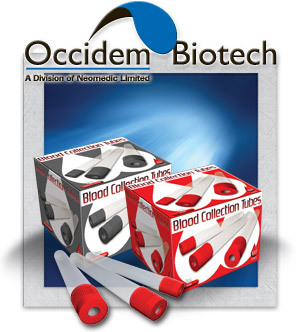 Optional Features Blood Sampling Port , Blood Sampling Bag Needle Protector .